We’re back in a taxi and heading to visit a woman who has lost two of her sons during a suicide attack in Kabul. The taxi travels along a narrow bumpy street. The snow has now turned to compacted ice. I recognise the area as being close to the Kuchi refugee camp we visited the day before. The district seems to be a fairly poor residential area with the common style of modest Afghan housing akin to the two-up two-down housing found in the north of England. We exit the taxi and pick our way through a maze of side streets. 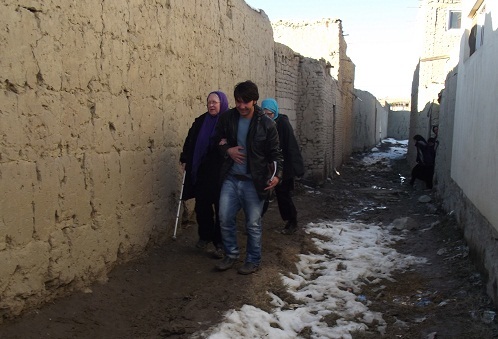 The path is a typical Kabul dishevelled path, our partially sighted delegate Susan is led by one of the youth peace makers- around puddles, over potholes and into a side door set into a weathered mud wall. We learn that terrorist attacks are almost daily in Kabul and more often than not, as per usual, it’s the ordinary people who suffer the most. The two-up, two-down has a small yard with a few chickens stalking around, a line of washing with kids clothing. 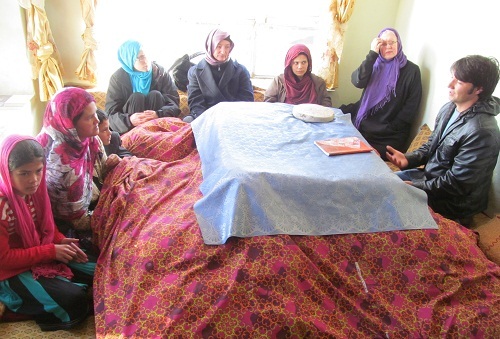 We step into a very basic home, the front room is barely furnished, but for the traditional form of heating, a stove under a frame covered in blankets. We sit on cushions around the heater and bury our feet under the warm blankets. We’re then introduced to Rohila, a woman in her early forties. She sits down opposite us and also tucks her feet under the communal blanket. She ushers her small children to sit with her. A girl aged 11 and a small boy aged 7, they huddle in close to her, she wraps her arms tightly round them. Her face carries creases of fear, worry and depression, her body seems enveloped with tiredness. She starts her story. The incident happened 2 years ago, her teenage sons aged 14 and 15 were walking home from school. Usually they would make their way back from school separately and at different times, but for some reason that day they were walking home together. For some unexplained reason there was a military tank on the roadside where they were walking. At the same time the boys passed the tank a suicide bomber drove a car into the tank causing it to flip over and kill 12 people. The official story reported 2 deaths. Since the incident she has become too afraid to let her other 2 children go to school. 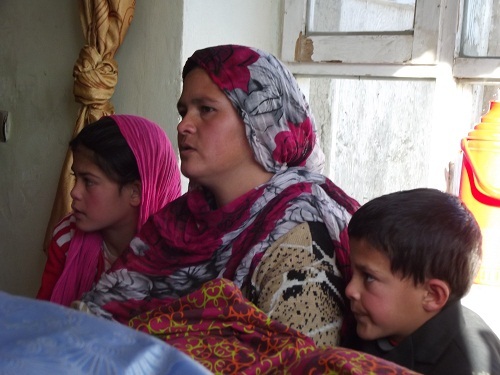 Her daughter Shazia says she wants to become a teacher and her son Roshot aspires to be a doctor. Neither have gone to school in the last year. The first day of snow is turning to slush as we pull up outside a Kuchi refugee camp on the edge of Kabul. A small heard of goats dressed in old jumpers graze on a skip of rubbish, our taxi driver pulls up over some large puddles; I tiptoe out of the vehicle onto solid land. The refugee camp is home to around 65 Kuchi nomadic families who have spent their lives wandering the land with livestock. The camp is set in the former Shah’s palace grounds, perhaps once the grandest building in Kabul, the decrepit palace now stands alone on a hill fort, dilapidated and riddled with bullet holes, a sad relic of a former time. The refugee camp is in a large walled off area which seems to be an extension to the palace grounds. Ramshackle tents constructed from what appears to be bits of rags, old sacking, old mats, juxtapose with the breathtaking snow-capped mountain ranges of the Hindu Kush, more synonomous with the pages of a National Geographic than a scene of desperate poverty and deprivation. The Kuchi are traditionally nomadic people who wander land from Pakistan to Iran grazing cattle and gaining casual work. 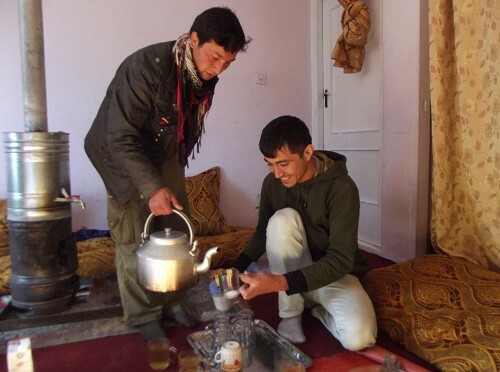 We hear that the Kuchi are considered amongst the least respected group of people within Afghanistan with tales of thievery and low living standards connected with their image. It remindeds me of the widely held perceptions which many Britons hold of the traveller community in the UK. Although the Kuchi are technically Pashtun in ethnicity they are considered a group apart and receive little to no alleigance from other Pashtuns. As we walk into the camp we are greeted by a gaggle of young children dressed in a patchwork of clothing styles: one small boy wearing a pair of high-heeled women’s shoes wading through the mud, another boy in an adult’s fleece top dangling around his knees, a girl in a leopard print jacket over a traditional Afghan trouser suit. It’s surprising that people at the bottom rung of society would meet and treat visitors with warmth and enthusiasm, however they did. We walk through a bit of the camp, past a group of women huddled under a makeshift shelter, some wearing burkas, others wearing modern clothing likely donated from a western source. The children follow us every step of the way wanting to have their photos taken. The tents and shelters are tightly packed together, there’s a cow tethered to a stick, some chickens pecking the ground, the bright sun melts the snow from the day before. The ground underfoot is a mixture of slush and mud. It seems like the camp elders are trying to work out the best tent to host us in. Eventually we were shown into a medium sized tent constructed from hardy canvas material. The muddy floor is lined with off-cuts of carpet and small rugs, I remove my shoes and step into the tent which is large enough to stand up in. I walk to the back of the tent and sit on the floor, the bits of carpet feel cold and damp. The other delegates and some members from the Afghan Peace Volunteers also enter the tent and we are introduced to Frida, a female elder of the camp who explains she’s received training from the Ministry of Public Health to teach other women about hygiene, she holds up a badge in a plastic sleeve. Frida is immediately striking, perhaps in her 50’s, her weathered face set with deep expressive wrinkles seems to exude strength and wisdom. Her eyes are intense and you somehow know she has seen and done much in her hard life. We learn that the camp has been there for four years, that the land belongs to the Government and the refugees live with the fear of being told to leave at any point… some sort of military helicopter flies overhead and drowns out Frida’s voice for a few seconds. Frida explains that they were in Pakistan until the UNHCR told them to return to Afghanistan and they would receive help. She tells us that so far they have received none of that promised help. Her voice is emotional as she explains (via an interpreter): ”Guests are like the light of our lives, we are unable to have our needs heard by leaders such as Karzai – why as president can’t he find a way to look after his people.” She explains that a man standing just outside the tent had to bury his two two dead children in the street as the Government refused to give them a plot for their dead. Frida goes on: ”If we can’t bury our dead we may as well not live”. A man who is sat in the doorway wrapped in a classic Afghan blanket wearing a traditional Pashtoon hat explains his feelings: “We are all trampled upon, no one will speak up for us or talk about our concerns, aren’t we born here, don’t we belong to this land?” We learn that all the men are unemployed, unable to find work, the children don’t go to school. Apparently there is a German NGO who provide some basic medicines but beyond that they can not get treatment for proper medical help. I personally would like to add to his message. The people of Britain should be speaking out against our own Government who have been central in installing the current corrupt Afghan Government who care very little for the welfare of its people. Our Government has been and continues to be central to the ongoing war which is stopping innocent people from living a life with basic human rights standards. The situation for the 350,000 internally displaced Afghans currently in the country is a symptom of a much bigger issue: it’s not working, and it will never work while Governments such as ours continue to prop up and maintain corruption and inequality.